Comments: ALTERNATE EDITION: ANNOTATED INSTRUCTOR'S EDITION contains the COMPLETE STUDENT TEXT with some instructor comments or answers. May not include student CD or access code. Great used condition. A portion of your purchase of this book will be donated to non-profit organizations. Over 1,000,000 satisfied customers since 1997! We ship daily M-F. Choose expedited shipping (if available) for much faster delivery. Delivery confirmation on all US orders. Comments: Cover is separating from binding or completely separated/missing. Excessive wear to cover, corners, and edges. Large portions of cardboard are exposed or missing entirely on corners/edges/spine. Title page intact. Page binding still intact and strong, and all pages are present and undamaged. School markings on/inside book. Generally clean inside, with minimal markings/highlighting on/inside book, none of which detracts from content. HARDCOVER. WE HAVE NUMEROUS COPIES. 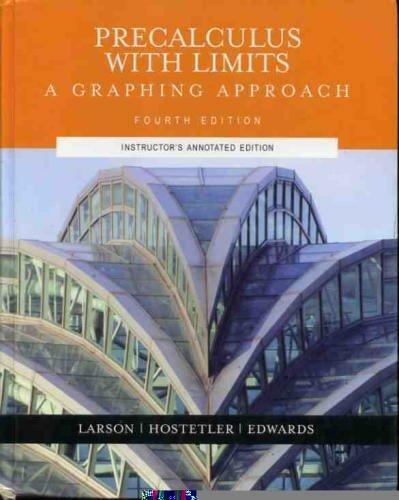 Ron Larson is the author of 'Pre-calculus With Limits: A Graphing Approach' with ISBN 9780618394791 and ISBN 0618394796. Loading marketplace prices 16 copies from $7.97 How does the rental process work?